The capital femoral epiphyses begin to ossify when an infant is aged 2-8 months. As the size of the ossification centers enlarge, shadowing may obscure the deeper acetabulum and limit US examination. Plain radiography then becomes the preferred modality for evaluating the hip. Dynamic US examination is operator-dependent, and it requires training and experience for confident evaluation of the infant hip. Also, because US is highly sensitive in hip imaging, minor abnormalities or normal early laxities may be revealed. This is especially true of static imaging alone. Some abnormalities detected by US may not be clinically significant, but they may be mistakenly overdiagnosed and overtreated. Frontal radiograph of the pelvis. The ossification centers of the capital femoral epiphyses are symmetric and located in the joint spaces. Both heads project in the inner lower quadrants formed by the intersection of the Hilgenreiner (H) and Perkin (P) lines. Shenton lines (S) are continuous and demarcated by the dashed lines. The acetabular angles are symmetric and less than 28° bilaterally. Frontal radiograph of the pelvis obtained in an infant before ossification of the capital femoral epiphyses begins. The legs are in the neutral position. The projected location of the unossified femoral heads must be estimated. The right hip is normal. 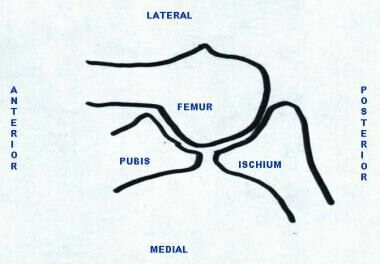 The probable location of the left femoral head projects beyond the joint space and into the lower outer quadrant formed by the intersection of the Hilgenreiner and Perkin lines. 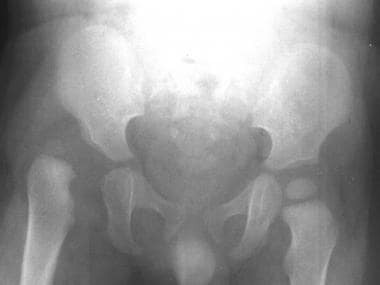 Frontal radiograph of the pelvis in a 1-year-old child with a dislocated right hip. The degree of ossification of the femoral head on the dislocated side is decreased compared with that of the normally located left hip. The abnormally located hip articulates with a false neoacetabulum. The initial treatment for DDH involves the use of a brace that maintains the hip in flexion and abduction. The brace is worn until the clinical and radiologic examination findings are normal. Children older than 6 months usually are too large to tolerate a brace. Closed reduction under general anesthesia is usually attempted first. The reduction can be evaluated with MRI or an arthrogram and a postreduction CT scan. Plain radiographs of the pelvis are most helpful when significant ossification of the capital femoral epiphyses has occurred and when adequate ultrasound evaluation cannot be performed. Plain radiographs of the pelvis are obtained in the frontal projection with the legs in the neutral position. Before the femoral heads begin to ossify, the projected locations must be estimated. The acetabular angle is determined by first drawing the Hilgenreiner (or Y-Y) line, which is a horizontal line between the 2 triradiate or Y-Y cartilages, and then drawing a second line connecting the superolateral and inferomedial margins of the acetabular roof, as Kirks and Griscom reported. The normal acetabular angle is approximately 28° at birth. The angle decreases gradually with age as a result of modeling of the acetabulum by the femoral head and of the maturation of developing bone along the superolateral acetabular roof. The acetabular angle is often increased in DDH because maturation and ossification of the acetabulum are abnormal and delayed. In the normal hip, the Shenton line is a smooth, unbroken arc that bridges the medial femoral metaphysis and the inferior edge of the superior pubic ramus. Displacement of the femoral head out of the joint space and disruption of the Shenton line are suggestive of DDH. Frontal radiograph of the pelvis obtained with the legs in the frog-leg position indicates that the plane of the femoral projection is toward the triradiate cartilage, suggesting that the hips are reducible. Plain radiography has a low sensitivity, exposes the infant to ionizing radiation, and does not provide dynamic information. 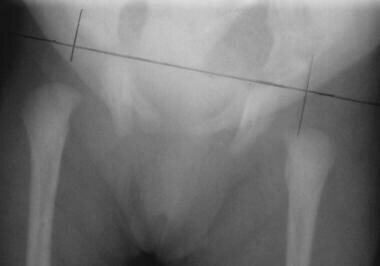 Radiographs are difficult to interpret before the capital femoral epiphyses ossify. Because some hips may be subluxatable but not frankly dislocated or dislocatable only with Barlow maneuvers, plain radiographs obtained in neonates or infants with their hips in the neutral position frequently fail to depict DDH. In infants with spica casts, low-milliamperage selective thin-section CT sections can confidently and quickly assess concentric reduction before the patient is discharged. Schematic drawing of the coronal plane used to assess the hip at ultrasonography. The transducer is placed on the lateral aspect of the thigh. Schematic drawing of the transverse plane of the left hip. The anteroposterior orientation depends on whether the right or left hip is being examined. The transducer is placed in the transverse orientation over the anterior upper thigh. A high-resolution linear array transducer must be used. The infant may be examined in the supine or lateral decubitus position, with the hip in a 90º flexed position. The operator uses one hand to hold the infant's knee at a right angle to the thigh. The palm of an open hand may be placed on the small of the infant's back. The thigh is held in the neutral position for imaging. The unossified cartilaginous femoral head appears as a speckled ball in the acetabular fossa. 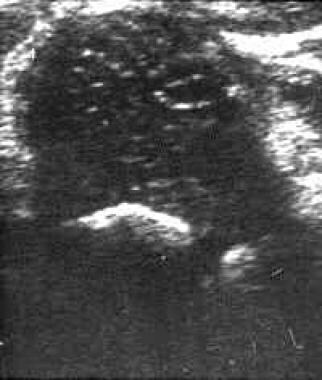 Once ossification begins, it appears as a central area of increased echogenicity in the center of the cartilaginous head. The femoral head should be centered in the joint space, with half or more of the femoral head medial to the baseline in the coronal plane. The extent of maturity of the acetabulum can also be quantified by using angular measurements (see the image below). The ACR considers the calculation of these measurements optional. The standard coronal sectioning plane must be used at the deepest portion of the acetabulum, where the ilium appears as a straight line, perpendicular to the femoral head and parallel to the surface of the transducer. Calculation of the alpha and beta angles to assess acetabular maturity. A standard coronal image is used. 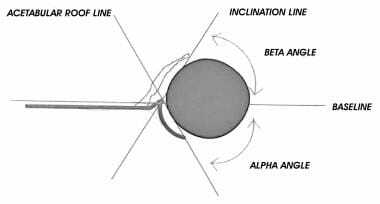 To quantify acetabular maturity, alpha and beta angles are determined by the application of 3 lines drawn in the standard coronal plane (see the image below). 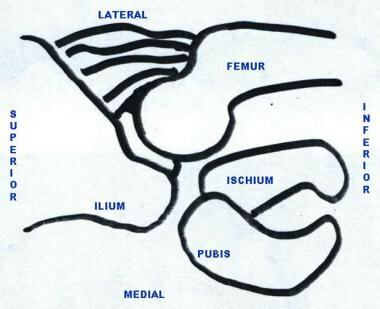 The baseline passes through the plane of the ilium, where it connects to the osseous acetabular convexity. The inclination line passes from the lateral end of the acetabulum to the labrum, parallel to the cartilaginous roof. The roofline passes along the plane of the bony acetabular convexity. Real-time coronal sonogram of the hip shows calculation of the acetabular alpha angle. An angle of 60° or greater indicates acetabular maturity. The alpha angle is used most commonly as a measurement of acetabular concavity, and it is calculated as the angle between the baseline and the roofline. A normal alpha angle is 60º or greater. Angles of 50-60º may be physiologically typical in the immediate neonatal period, but hips with these angles are considered immature and require clinical and US follow-up. Angles of less than 50º are always considered abnormal and require treatment. The beta angle is measured between the baseline and the inclination line. It indicates the acetabular cartilaginous roof coverage. An angle of less than 55º is considered normal. The smaller the angle, the less the cartilaginous coverage and the better the bony acetabular coverage of the femoral head. Not all dynamic hip imagers use these angles for the diagnosis and care of babies with DDH. Many use descriptive terms instead of numbers. In a complementary method of assessing acetabular development, the distance between the medial aspect of the femoral head and the baseline (d) is compared with the maximum diameter of the femoral head (D); this d/D ratio is expressed as a percentage. This ratio represents the coverage of the femoral head by the bony acetabulum in the standard coronal plane (see the image below). Coverage of 58% or greater is considered normal. The smaller the coverage, the greater the acetabular immaturity. Real-time coronal sonogram of the hip with calculation of the d/D ratio. Coverage of 58% or greater is considered normal. Stress maneuvering (ie, the Barlow maneuver) with the femur in 90º of flexion and maximum adduction is performed during transverse imaging to assess stability (see the first 2 images below). 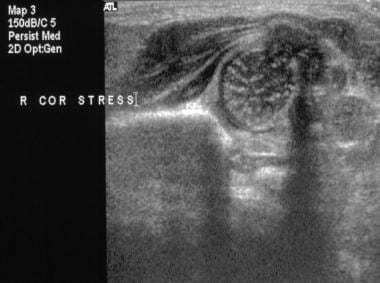 The use of stress is optional in coronal imaging, which may be performed with the patient's leg in a flexed or neutral position. Stress is omitted if the infant is receiving treatment for DDH with a Pavlik harness. Stress maneuvering reveals instability, subluxation (see the third image below), or dislocation (see the fourth image below). In dislocated hips, the Ortolani maneuver should be performed to check for reducibility. Real-time transverse sonogram of the right hip obtained without stress maneuvering reveals that the cartilaginous femoral head is well centered above the triradiate cartilage between the pubis and ischium. Echoes are present through the interface with the cartilage; this appearance has been likened to that of a lollipop, in which the femoral head is the "candy" and the echoes through the cartilage are the "stick." In a normally stable hip, this appearance should be maintained with stress maneuvering. Real-time sonogram of the right hip obtained with stress maneuvering reveals that the femoral head is posteriorly displaced over the ischium. Coronal real-time sonogram of the hip obtained with stress maneuvering reveals significant lateral motion, which is not out of the plane of the baseline. This was accompanied by posterior motion in the transverse plane. Coronal real-time sonogram of the hip obtained with stress maneuvering reveals that the capital femoral epiphysis displaces out of the plane of the baseline. This dislocatable hip was reimaged after Ortolani maneuvering, and the dislocation was reducible. An ancillary sign of instability is asymmetry in the degree of ossification of the femoral heads. Inexperienced US examiners can mistake the greater trochanter cartilage for the femoral head and incorrectly diagnose developmental dysplasia of the hip (DDH). History of abnormal hip physical examination in the neonatal period, which subsequently normalizes. Monitoring patients with DDH being treated with a Pavlik harness or other splint device. Sankar WN, Weiss J, Skaggs DL. Orthopaedic conditions in the newborn. J Am Acad Orthop Surg. 2009 Feb. 17(2):112-22. [Medline]. Karmazyn BK, Gunderman RB, Coley BD, Blatt ER, Bulas D, Fordham L, et al. ACR Appropriateness Criteria on developmental dysplasia of the hip--child. J Am Coll Radiol. 2009 Aug. 6(8):551-7. [Medline]. Mulpuri K, Song KM, Gross RH, et al. The American Academy of Orthopaedic Surgeons Evidence-Based Guideline on Detection and Nonoperative Management of Pediatric Developmental Dysplasia of the Hip in Infants up to Six Months of Age. J Bone Joint Surg Am. 2015 Oct 21. 97 (20):1717-8. [Medline]. Talbot C, Adam J, Paton R. Late presentation of developmental dysplasia of the hip : a 15-year observational study. Bone Joint J. 2017 Sep. 99-B (9):1250-1255. [Medline]. Paton RW. Screening in Developmental Dysplasia of the Hip (DDH). Surgeon. 2017 Oct. 15 (5):290-296. [Medline]. Graf R. Guide to Sonography of the Infant Hip. New York, NY: Thieme Medical; 1987. Graf R. [The use of ultrasonography in developmental dysplasia of the hip.]. Acta Orthop Traumatol Turc. 2007. 41 Suppl 1:6-13. [Medline]. Peled E, Eidelman M, Katzman A, Bialik V. Neonatal incidence of hip dysplasia: ten years of experience. Clin Orthop Relat Res. 2008 Apr. 466(4):771-5. [Medline]. Schams M, Labruyère R, Zuse A, Walensi M. Diagnosing developmental dysplasia of the hip using the Graf ultrasound method: risk and protective factor analysis in 11,820 universally screened newborns. Eur J Pediatr. 2017 Sep. 176 (9):1193-1200. [Medline]. Morin C, Harcke HT, MacEwen GD. The infant hip: real-time US assessment of acetabular development. Radiology. 1985 Dec. 157(3):673-7. [Medline]. Kotlarsky P, Haber R, Bialik V, Eidelman M. Developmental dysplasia of the hip: What has changed in the last 20 years?. World J Orthop. 2015 Dec 18. 6 (11):886-901. [Medline]. [Full Text]. LeBa TB, Carmichael KD, Patton AG, Morris RP, Swischuk LE. 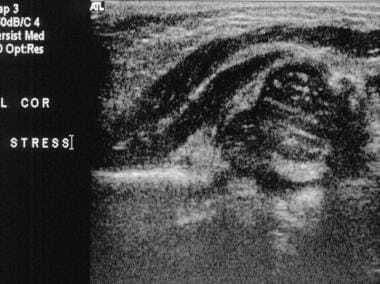 Ultrasound for Infants at Risk for Developmental Dysplasia of the Hip. Orthopedics. 2015 Aug. 38 (8):e722-6. [Medline]. Atalar H, Dogruel H, Selek H, Tasbas BA, Bicimoglu A, Gunay C. A comparison of ultrasonography and radiography in the management of infants with suspected developmental dysplasia of the hip. Acta Orthop Belg. 2013 Oct. 79 (5):524-9. [Medline]. von Kries R, Ihme N, Altenhofen L, Niethard FU, Krauspe R, Rückinger S. General ultrasound screening reduces the rate of first operative procedures for developmental dysplasia of the hip: a case-control study. J Pediatr. 2012 Feb. 160 (2):271-5. [Medline]. 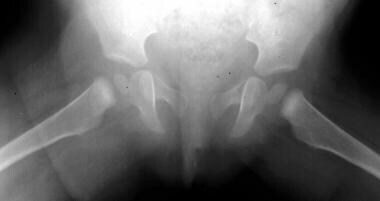 Dezateux C, Rosendahl K. Developmental dysplasia of the hip. Lancet. 2007 May 5. 369(9572):1541-52. [Medline]. Kirks DR, Griscom NT. Practical Pediatric Imaging Diagnostic Radiology of Infants and Children. Philadelphia, Pa: Lippincott-Raven; 1998. Ozonoff MB. Pediatric Orthopedic Radiology. 2nd ed. Philadelphia, Pa: WB Saunders; 1992. 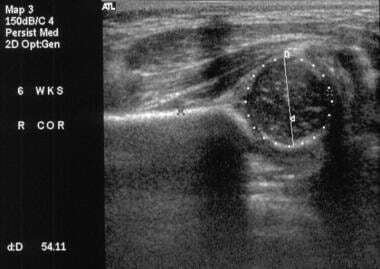 Wientroub S, Grill F. Ultrasonography in developmental dysplasia of the hip. J Bone Joint Surg Am. 2000 Jul. 82-A(7):1004-18. [Medline]. Tudor A, Sestan B, Rakovac I, Luke-Vrbanic TS, Prpic T, Rubinic D, et al. The rational strategies for detecting developmental dysplasia of the hip at the age of 4-6 months old infants: a prospective study. Coll Antropol. 2007 Jun. 31(2):475-81. [Medline]. Uchida S, Utsunomiya H, Mori T, Taketa T, Nishikino S, Nakamura T, et al. Clinical and Radiographic Predictors for Worsened Clinical Outcomes After Hip Arthroscopic Labral Preservation and Capsular Closure in Developmental Dysplasia of the Hip. Am J Sports Med. 2015 Oct 1. [Medline]. Mahan ST, Katz JN, Kim YJ. To screen or not to screen? A decision analysis of the utility of screening for developmental dysplasia of the hip. J Bone Joint Surg Am. 2009 Jul. 91(7):1705-19. [Medline]. [Full Text]. Kotnis R, Spiteri V, Little C, Theologis T, Wainwright A, Benson MK. Hip arthrography in the assessment of children with developmental dysplasia of the hip and Perthes' disease. J Pediatr Orthop B. 2008 May. 17(3):114-119. [Medline]. Janssen D, Kalchschmidt K, Katthagen BD. Triple pelvic osteotomy as treatment for osteoarthritis secondary to developmental dysplasia of the hip. Int Orthop. 2009 Feb 12. [Medline]. Beltran LS, Rosenberg ZS, Mayo JD, De Tuesta MD, Martin O, Neto LP, et al. Imaging evaluation of developmental hip dysplasia in the young adult. AJR Am J Roentgenol. 2013 May. 200 (5):1077-88. [Medline]. Yilmaz S, Aksahin E, Duran S, Bicimoglu A. The Fate of Iliopsoas Muscle in the Long-term Follow-up After Open Reduction of Developmental Dysplasia of the Hip by Medial Approach. Part 1: MRI Evaluation. J Pediatr Orthop. 2015 Nov 13. [Medline]. [Guideline] American Institute of Ultrasound in Medicine. 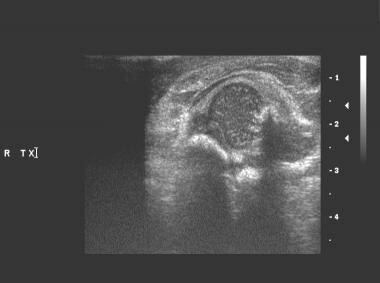 AIUM practice guideline for the performance of an ultrasound examination for detection and assessment of developmental dysplasia of the hip. 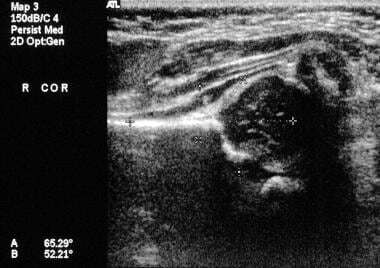 J Ultrasound Med. 2013 Jul. 32 (7):1307-17. [Medline]. [Full Text]. [Guideline] Dempsey ME, Karmazyn B, Coley BD, Dillman JR, Dory CE, Garber M, et al. ACR Appropriateness Criteria® developmental dysplasia of the hip--child. American College of Radiology (ACR). Available at https://acsearch.acr.org/docs/69437/Narrative. 2013; Accessed: January 24, 2018. [Guideline] Shaw BA, Segal LS, SECTION ON ORTHOPAEDICS. Evaluation and Referral for Developmental Dysplasia of the Hip in Infants. Pediatrics. 2016 Dec. 138 (6):[Medline]. [Full Text]. [Guideline] Mulpuri K, Song KM, Gross RH, et al. The American Academy of Orthopaedic Surgeons Evidence-Based Guideline on Detection and Nonoperative Management of Pediatric Developmental Dysplasia of the Hip in Infants up to Six Months of Age. J Bone Joint Surg Am. 2015 Oct 21. 97 (20):1717-8. [Medline]. [Full Text]. Hauk L. Developmental Dysplasia of the Hip in Infants: A Clinical Report from the AAP on Evaluation and Referral. Am Fam Physician. 2017 Aug 1. 96 (3):196-197. [Medline]. Lee J, Spinazzola RM, Kohn N, Perrin M, Milanaik RL. Sonographic screening for developmental dysplasia of the hip in preterm breech infants: do current guidelines address the specific needs of premature infants?. J Perinatol. 2016 Jul. 36 (7):552-6. [Medline].